CRUZERS ARE TRYING TO STEAL TRUMP DELEGATES IN ST. CHARLES! This video was just sent in from the Republican meeting at St. Francis Howell high school in St. Charles, Missouri. Donald Trump won Missouri and virtually every district in the state! Now the Cruz camp is trying to steal the delegates. The Trump supporters are in full rebellion. Video from caucus in district 2 and 3 GOP meeting held St. Francis Howell High School. I am a first time caucus goer and this is a new experience for me. If you are a political outsider (like Trump) you don’t have local control insiders like the establishment. The bottom line… Trump slate turned in our delegates and it was totally rejected! This last video I took from this morning was the Trump group gathered after they adjournment the meeting (caucus) . Telling people who to contact about how the caucus went down, how the Trump slate was rejected, how the insiders (establishment) controlled the agenda. They wanted the slate of names introduced to be read out loud, would not do it! Asked it a certain group ( I really couldn’t understand the name they said, a lot of yelling going on .. I think something like Pacaderm Group?) was on the list. After a lot more yelling the chairmen said yes that their names had been added to the Cruz slate and no they did not have to be present to be added to the Cruz slate for delegates. They would not allow a vote on a amendment offered up ..stating delegates should vote for the candidate voted for by the will of the people (MO voters). They would not allow a hearing or vote of it. Got crazy again after that. I have never been to a MO caucus… I always vote in the primary and thought that was it! My vote would be counted win or lose, but this process seemed to be purposefully going against the will of the voters. 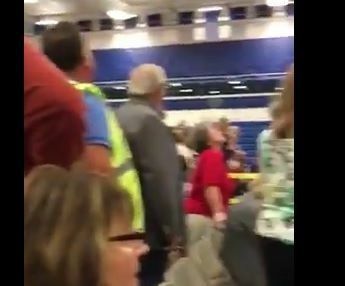 The man in the red shirt who comes up in the video ( Cruz person, has worker tag hanging around his neck) came over to the Trump group to tell them they don’t know how the caucus is run and your people need to get off their lazy asses and get educated in the process. Cruz supporters in St. Louis sent out this letter describing how they plan on stealing delegates in Missouri on Saturday. Saturday is caucus day in Missouri to select the first round of delegates to ultimately go to Cleveland. As you probably know, the first vote in 5 of the Congressional districts are pledged to Trump and in the other 3 to Cruz. HOWEVER, on the second ballot should those delegates at the Congressional District Caucuses on April 30 and the State Convention on May 20-21 in Branson be Cruz supporters, and we do this across the nation, Ted Cruz can win the nomination on the second ballot. Attend the local Caucus in your local county/township. Go to the State Republican Party web site (https://www.missouri.gop/election-2016/#find) to find location, arrive an hour early, and seek to identify the Cruz supporters. Even better, take all your Cruz friends and family with you and be a delegate to the Congressional Caucus and the State Convention.Whoever has the most numbers and elects their slate will prevail.